Do I need extra insurance to deliver? Most basic personal ICBC auto-insurance policies permit up to 6 days per month of commercial use. This should be indicated on your owner’s certificate. If you are active on Eats for more than 6 days per month, you will need to contract your auto-insurance broker or visit the ICBC website to obtain business coverage. If you have optional coverages (i.e. above the basic Autoplan coverage), you should contact your auto-insurance broker or visit the ICBC website to see what is allowed under your policy and if additional coverage is needed. You are responsible for ensuring that you have insurance coverage that meets compulsory requirements as well as your own coverage needs. Are there any additional requirements I should be aware of? Delivery partners are independent contractors and responsible for managing their business including tax and licensing obligations. If you are going to deliver by car, see the City's business licence general application. If you are going to delivery by bike, see the City's bike courier requirements. How do I sign up to be an Uber Eats Partner? There are two options to sign up to be an Uber partner. The signup process is different if you would like to deliver using your car or bicycle. Upload the following documents to your account. Learn more about the required documents. Additionally, we will be hosting in-person information sessions in November to help partners get registered. Learn more about the info sessions in Vancouver. When is Uber Eats launching in Vancouver? Uber Eats launched in downtown Vancouver in December 2017 and is looking to expand its delivery areas in the upcoming weeks. When are the best times to deliver? After the service is launched, we will share more information about when and where are the best times to deliver. With Uber Eats, partners earn for each delivery that they complete via a pickup fare, a dropoff fare, a per kilometre rate, and a per minute rate for each delivery they complete. Additionally, partners may earn additional incentives for delivering during certain times of day or for completing a certain number of trips. Can I sign up to drive Uber Rides? Providing rides with Uber is currently not an option in British Columbia. However, you can still sign up for Uber Eats. To sign up to be an Uber Eats partner, you have the option of delivering by bicycle or by car. If you are interested in speeding up the process to bring ridesharing to British Columbia, please contact your local MLA. Do I need a special driver’s licence to deliver with Uber Eats? You don’t need a special driver's licence to use your car or bike to deliver with Uber Eats. In order to partner with Uber, partners must undergo an Enhanced Criminal Record Search with zero tolerance for any criminal activity. Additionally, if you are using a car to do deliveries - you must submit a record of your last five years of driving history. This can be obtained by visiting ICBC's driving record page. 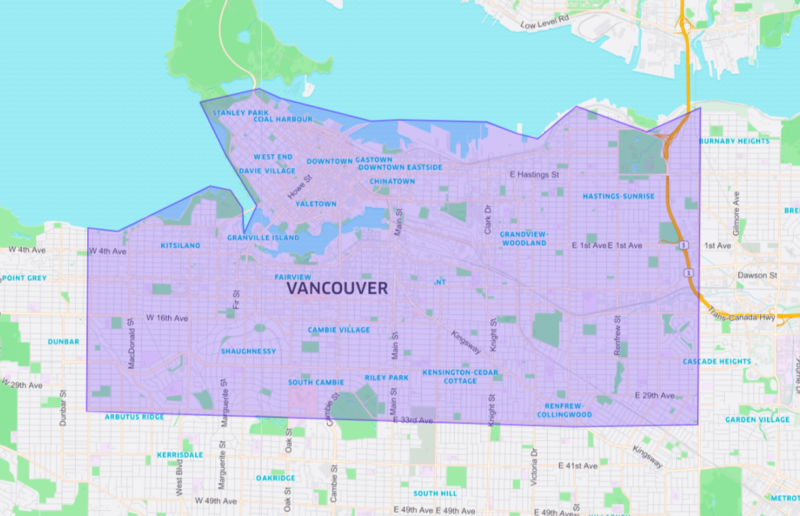 Uber Eats will be available within the City of Vancouver as per the image on this map. We are looking to expand our services soon and will update delivery partners and customers as the service becomes available in more areas.